They say you aren't supposed to say "Thank you" when someone gives you plants. Something about them not growing if you do. But I can't help it. Costa Farms, thank you - many times over. When Fed Ex turned into our driveway this afternoon and delivered a large box, I got all excited to see what was in it when I noticed the return address. From the time I got it open, looked down into the box and saw what was in there, until I removed them from the box and stood to admire them, I don't think my mouth ever closed. 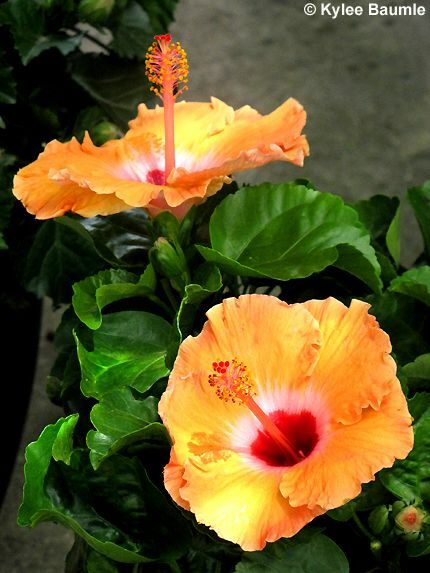 Two gorgeous Tradewinds® tropical hibiscus, a Curcuma and a Heliconia, all from the Costa Farms Shades of Summer Collection. Just when I was feeling like tearing my gardens up because they're getting that ratty, dry, late summer look, these perked me right up and got me excited about my gardens again. Coincidentally, they came in time to help decorate the area around the pool for our celebration of our 35th wedding anniversary on Sunday. Again, thank you! 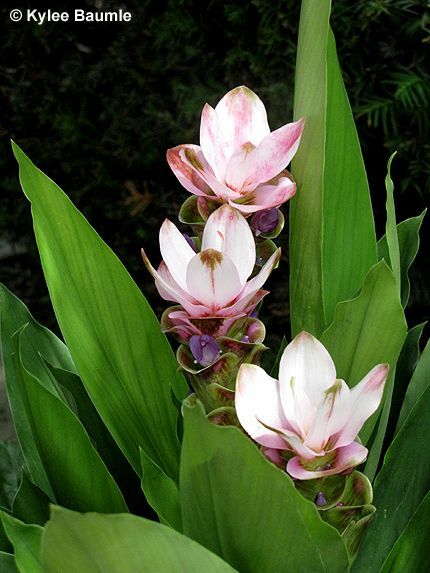 The plants were expertly packed and none of them suffered even one broken leaf or bud in transport from Florida. The containers they were growing in were suitable for display, not the usual thin black nursery pots most plants come in. 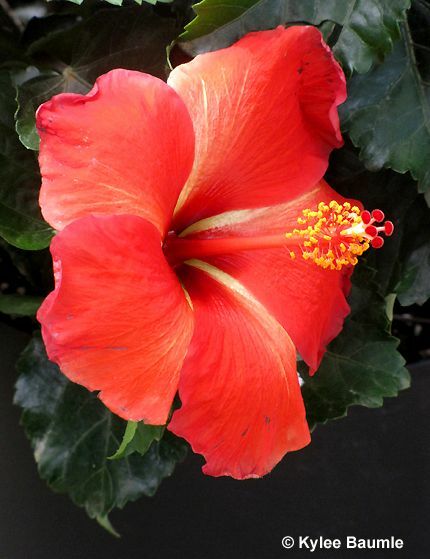 You can find Costa Farms plants in garden centers everywhere. Look for them! 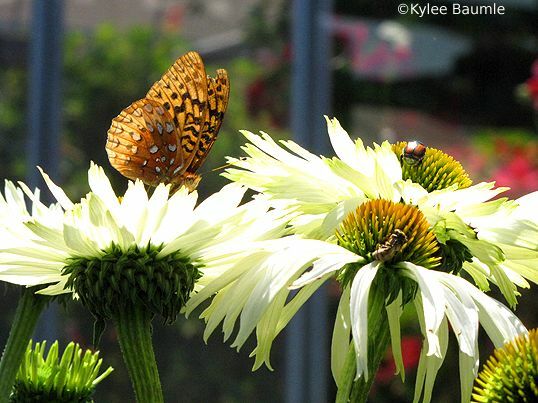 Gardening has opened my eyes to so many other wonderful creations that co-exist with the plants. Some of them I knew were there, but I didn't care about them. Others, I had no clue there were such things. I don't think I'd ever get bored with "just gardening," but because of these other discoveries, there isn't a chance of that happening. Oh, and three Japanese Beetles, which promptly ended up in the pool skimmer, never to chomp on my roses again. 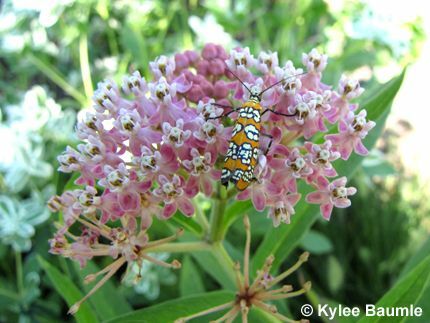 I think they're a beautiful insect, but I value my plants and flowers more than their lives. We've lost another caterpillar since the last update a week ago, so we've got 11 at present. It was one of the smallest and it may have been a casualty of one of its siblings, since I've seen them biting each other on occasion. They don't move very fast in general, but when one bites the other, they rear back their head pretty fast! The shed skin is laying just above the caterpillar. Not sure which instar it's in now. There are five total. Lots of changes going on now. They're developing spots on the sides and a coat of fine hairs. Also, the head and rear are prominent and have developed spots as well. Their appetites are amazing. 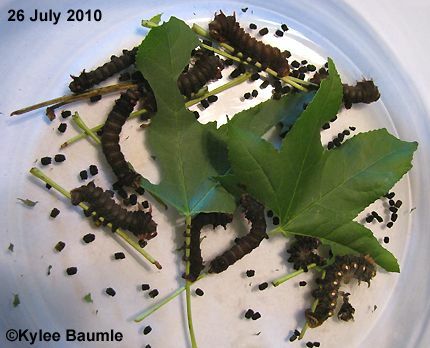 In a day's time, these 11 caterpillars will eat nine large sweet gum leaves! That's nearly one leaf each per day. We gave them a maple leaf just to see if they'd eat something different, since I'd read that once they start on one type, they don't change. Well, they will, because in the morning, the maple leaf was gone. Eating that much means lots of poop. Okay, so the PC word is "frass." But it's still poop. (Besides which, poop is a multi-functional word, being a verb as well as a noun. 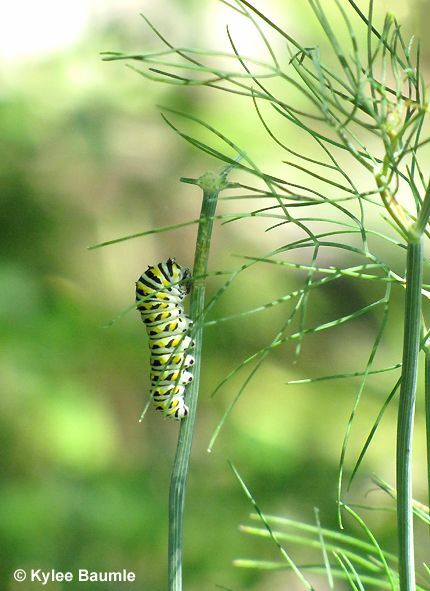 Caterpillars don't frass.) I clean the bowl twice a day because I figure it can't be good breathing the fumes from all that poop and I've seen them trying to eat it. ICK. 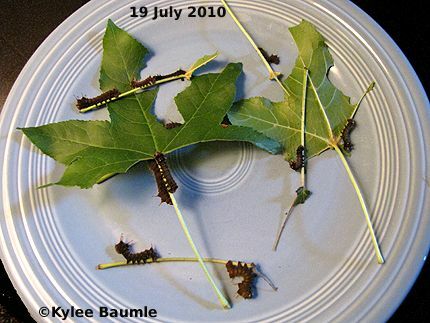 Caterpillars in a nice, clean bowl with fresh eats. The largest one is now over two inches long. It's amazing to me that just three weeks ago, they were a mere 2 mm in length. There are likely other caterpillars outside, because Romie found another female (dead) laying in the neighbor's yard a couple of days ago. Amazing that we've never seen these before in our lives, then we see two within a month! 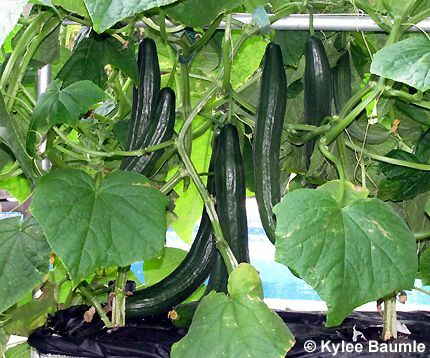 I mentioned earlier this year that Mom had given her EarthBox® to me and that I was going to grow cucumbers in it. Previous attempts at growing cucumbers had not yielded very good results so I thought I'd give this EarthBox® thing a go with them. 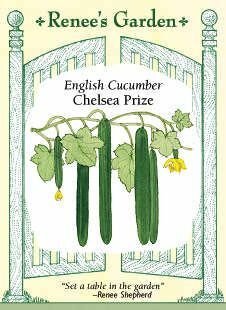 For the past week, we've enjoyed a great harvest of Chelsea English Cucumbers planted from seed from Renee's Garden Seeds. I got them planted a little late this spring, but the vines are now growing along the ground, after climbing the trellis of the EarthBox®. 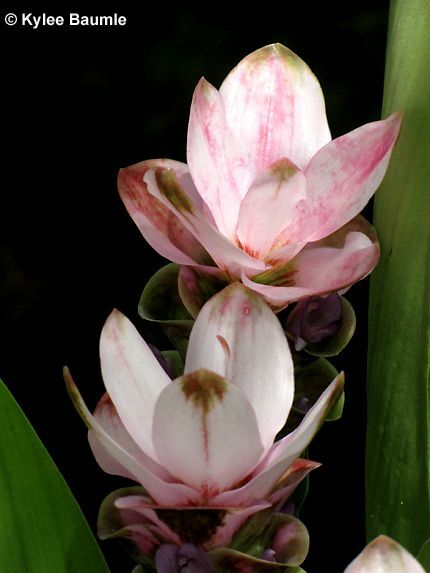 They get morning and mid-day sun and are shaded by mid-afternoon on. With the EarthBox®, you just need to make sure the water reservoir never goes dry, and with the hot and dry weather we've been having, I find that I need to fill it once a day. I'm amazed at what healthy plants I've got. Never before have my cucumber vines looked so good! Mix salt with cucumbers and onions; let stand 1 1/2 to 2 hours. Mix sugar and vinegar until sugar dissolves; drain pickles well and put into jars. Cover with brine. Put in refrigerator and let stand 2 weeks before using. Good for 6 months. By the way, you can use regular salt, but the liquid in your pickles will be cloudy, due to the anti-caking ingredient that's used in regular table salt. Also, canning salt contains no iodine. A couple of months ago, Allsop sent an e-mail asking if I'd like to try a couple of their garden products. 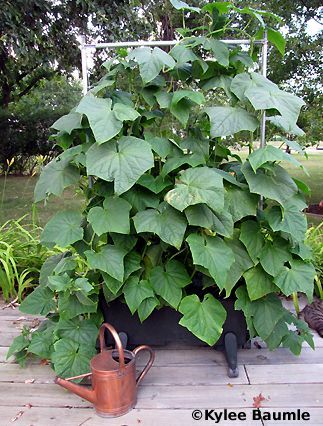 Since I'd already reviewed their WheelEasy LE canvas wheelbarrow (and love it), as well as having admired the plant tags for awhile now, I enthusiastically agreed. 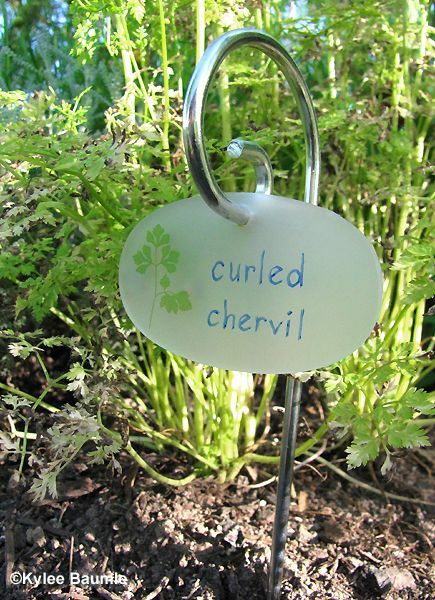 Their plant tags come in sets of six, with a choice of design - herbal or botanical. I chose the herbal. The tags themselves are made of flexible opaque rubber and are UV treated to enhance their use outside. They come in an attractive presentation folder. 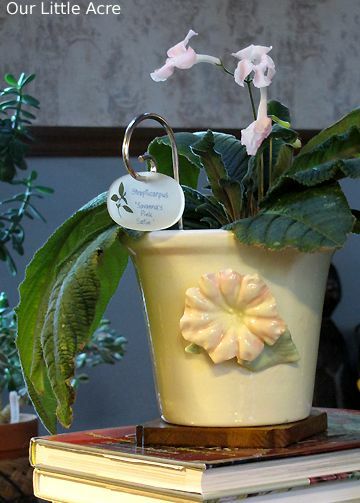 The tags are reusable, in that if you use the recommended gel pen for writing the names of your plants on the tag, the writing can be removed with soap and water. I used a Bic gel pen and had no problems washing my printing from the tags. Simply using water didn't do it, but adding soap took it right off. That's good, since you don't want rain washing your lettering off! I put one outside several weeks ago where it only gets a small amount of morning sun, the rest of the time being in dappled shade. Unfortunately, the rubber yellowed and I find it unattractive. I also used one in one of my house plant containers. It too looks great. The website does advise that after a period of time outside or in the sun, the lettering may be harder to remove and that the rubber may yellow from exposure. 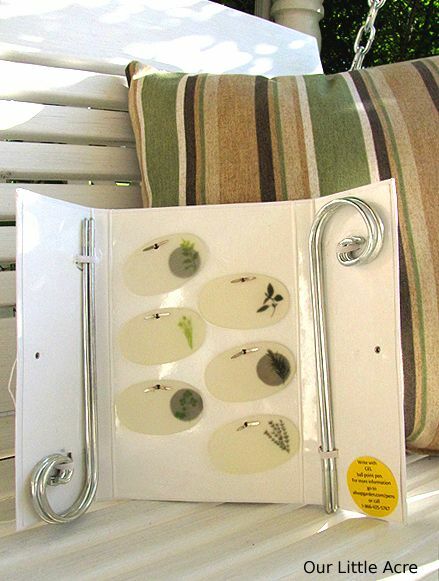 The plant tags sell for $15.99 for the set of six. One more minor complaint (besides the yellowing) is that the steel planting stakes are too short for my preference. 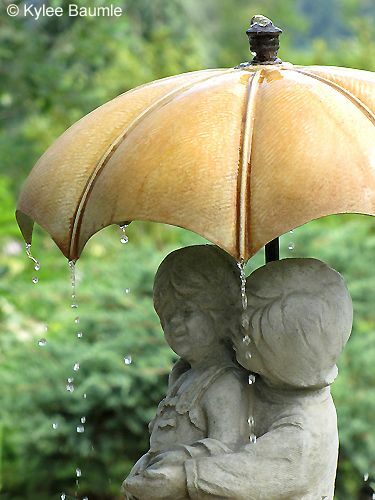 Adding a few more inches to them would make their use more practical for outdoors. In house plant pots, the current height is sufficient, but could benefit from an inch or two of additional height as well. We noticed that the potato plants in the barrels were suffering a couple of weeks ago. Sure, they were dying back like they were supposed to do this time of year, but something was helping them along. Many of the stems were devoid of leaves and had the same look tomato plants do when they've been stripped by tomato/tobacco hornworms. Yet, I never saw any worms on them, so if that's what did it, they worked undercover. Today, the plants were dead for sure, so we decided to dig the potatoes. I say "we" because Romie came in and asked if I wanted to watch. It was a team effort. In the first barrel, containing white potatoes, we found more than potatoes. 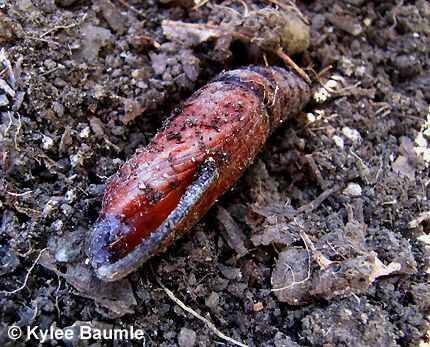 In the second scoopful of soil, I noticed a pupa. 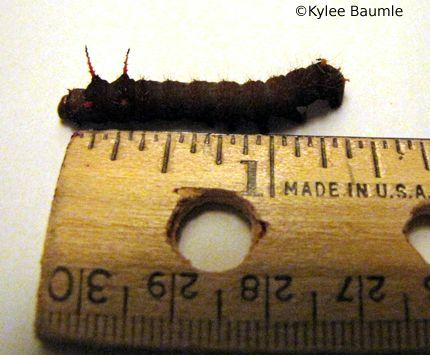 A very large pupa, measuring at least two inches long. Perhaps this was the pupating worm that had stripped the leaves from the potato plants? Upon seeing this big boy, and knowing a little bit about hornworm pupas, I'd say that's exactly what had happened. After he'd had his fill of potato leaves, he settled right down into the soft dirt for a little sleep and metamorphosis. He was wiggly when I picked him up, but we put him in the big dirt pile we have nearby and covered him up so he could finish his metamorphosing. 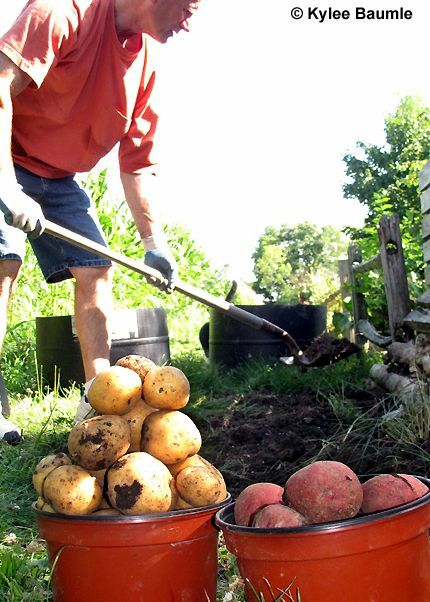 We'd planted four half-barrels of potatoes, two with white and two with red (Red Norland). 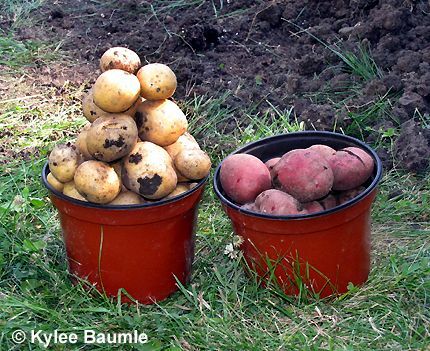 After all was said and dug, it was clear that the white potatoes outperformed the red ones, and we didn't get a huge amount from either. But we took them in and cooked up the smaller ones, added some butter, salt and pepper and, "M-m-m-m-m-m-m!" Our harvest of potatoes, collected in 8" nursery pots. Next year, we won't bother to add soil as the plants grow, because these potatoes only produced at the very bottom of the barrel. I liked growing them in the barrels because it saved room for other vegetables in the garden proper. We'd grown them in the garden before and they took up quite a bit of room. Lisa may have left her heart in Buffalo, but I left my umbrella, a perpetual calendar (newly purchased, no less), and a sweater I'd spent all summer looking for (and had worn only once). I suppose I have no one to blame but myself, but a person's brain can only hold so much in it at one time before it starts spilling out whenever and wherever it pleases. I don't have any control over the part that spills out either, or else I'd nudge bad memories and useless information on their way. 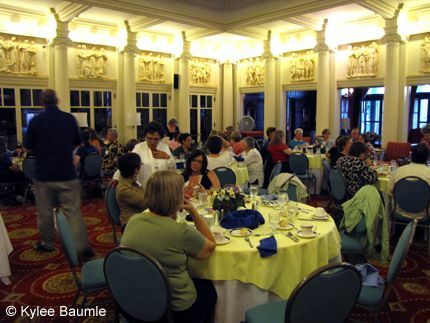 ...and the next night, we were on the second floor in the elegant whatever-that-room-was-called. It had rained that day and I took my umbrella along, just in case I needed it when we left to walk back to the hotel. Turns out we didn't. Turns out I forgot I'd even taken my umbrella along. I'd also taken my new white sweater along because with rain and darkness usually comes cooler temperatures. 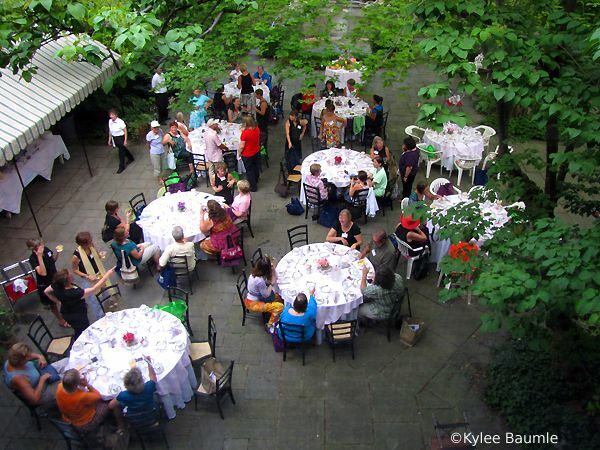 When we left the 20th Century Club, I miraculously remembered to take my white sweater with me and tied it around the handle of my purse. The Soil Sisters worked on film footage for a music video as we made our way down Chippewa Street, otherwise known as "The Chip Strip." Anneliese Valdes, from CobraHead, was the videographer and she filmed us as we giggled and laughed our way back to the hotel. 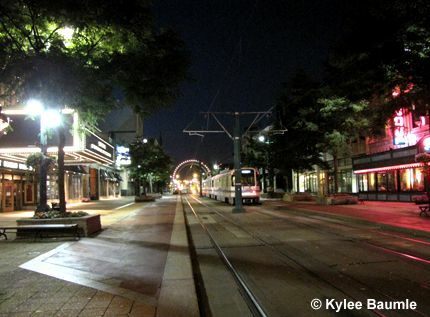 We had a great time and I'll never forget as we jumped together, hand-in-hand, off the trolley platform. The next day, one of our stops as we toured gardens around the Buffalo area was the Lockwoods Greenhouses and Garden Center in Hamburg. There were lots of wonderful goodies to be had, and though we were to eat lunch outside there, I first headed to the plants, because they were calling my name and I couldn't resist. It was a siren song. I bought three plants - a Tricyrtis, a Vernonia, and a Tatting Fern. And a cute cat business card holder. And a garden sign that says, "I must have flowers, always, always," (which is why I was plant shopping while everyone else was eating). And a vintage botanical print clipboard. And a vintage botanical print perpetual calendar that matches the clipboard to hang in my potting shed. And a scallop edged flower pot. That's all. I stowed my purchases in the back of the bus, behind the seats where we were sitting. When we got back to the hotel, I gathered them up and went to our room. After a little rest, we went back out to dinner, then back to the hotel again. The hotel room was getting kind of out of hand by this point, so I decided to get things ready for when we'd leave and I consolidated some packages for easy transport. But something was missing. The calendar. I looked high and low and it was nowhere to be found. I'd remembered propping it up against the inside wall of the bus, but I didn't remember retrieving it from its spot. I'd carried it by its fine wire handle and knew I hadn't carried that to the hotel room. It was still on the bus. Wherever that was by now. You don't have to watch for long to see why I woke right up and was horrified. My new sweater. Or rather, the one I used to own. So, coupled with the discovery of the calendar being left on the bus just half an hour before, and the sweater I'd searched most of the summer for being lost forever, I proceeded to whine around and mutter angrily to whomever would listen (sorry, Mom). My little tantrum was soon over and once again, the hunt was on for The Sweater. But in spite of it all, things could be worse, of course. Earlier that evening, those of us that were staying through Monday went to dinner at Mother's to show our appreciation in some small way to Elizabeth and Jim for all they'd done. I drove to the restaurant, with Mom in the passenger seat and Pam (Digging) and Diana (Sharing Nature's Garden) in the back seat. I had the green light and as I slowed to make a left turn, at the last second, I noticed a speeding car coming from that direction and slammed on the brakes as the car zoomed through the intersection, running the red light. Just a second away from what would likely have been a fatality - mine and perhaps others - things get put into perspective real quickly. The day wasn't so bad after all. 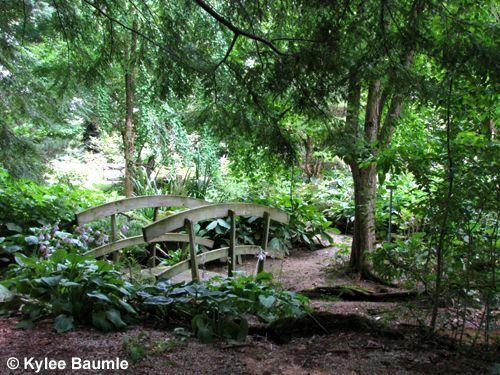 Mom and I took to the road again, this time heading east to Bellville, OH, to the famed Wade and Gatton's Botanical Gardens and Nurseries. 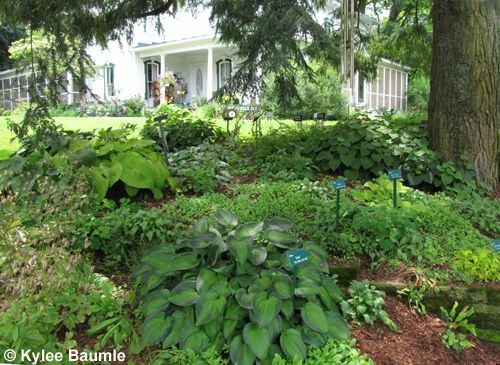 Home of the hostas. LOTS of them. I'd heard about this place from Mom several years ago and wanted to visit, but just never seemed to take the time to make the 2½-hour trip. But sooner or later, we get around to doing those things that are on "the list" and as I sit here thinking about our day, I can't believe I waited so long. Mom had been there once before and was more than willing to visit again and now I know why. She went to see the hostas, as did I, but the highlight of our trip wasn't all about the hostas. As we neared our destination, we were reminded that not all of Ohio is like our glacier-flattened once-swampy corner of the state. Richland County is much, much hillier. It's beautiful, this rolling countryside and we always make comment about that, although we find ourselves giving special consideration to how driving requires a little more caution, what with all the hills and not being able to see as far down the road. 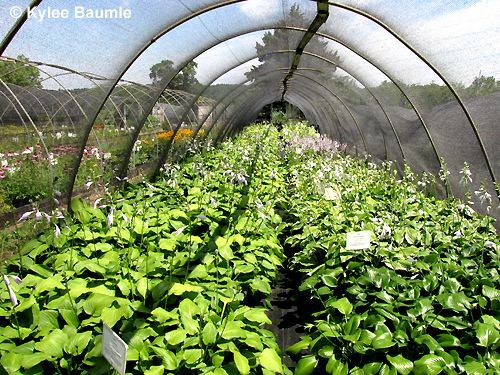 We took the winding drive back to Wade and Gatton Nurseries, parked the car, and immediately began to go in and out of the 20+ hoop houses that held hostas in numbers unlike any we'd ever seen anywhere before. 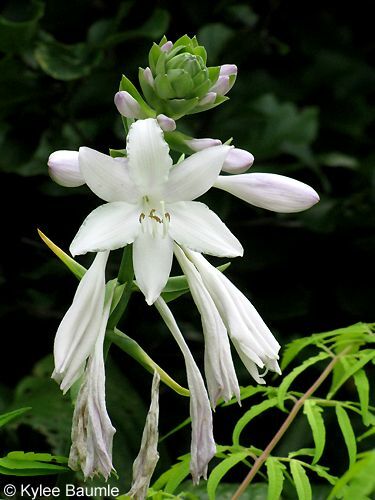 I soon realized that if I saw a hosta I liked, I'd better grab it immediately because I'd likely never be able to find it again. 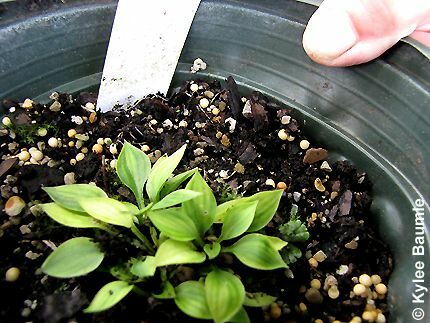 Hostas are priced by the crown and there are pots that have varying numbers of crowns in them. This could have gotten us in trouble, but an employee explained the specifics of this when he saw us with a pot that had almost more crowns than could easily be counted. We made our choices, including my one free plant that first-time visitors are allowed to choose. I purchased 'Snowstorm', 'Rainforest Sunrise', and 'Ft. Knox.' My free one was 'Kitty Cat', of course. Cats of all sorts just seem to find their way to our house. Isn't this miniature hosta awesome? No really, it's 'Awesome'! There was a bus group that arrived shortly after we did, and don't you know, it was from our area and we knew several of the women in the group! 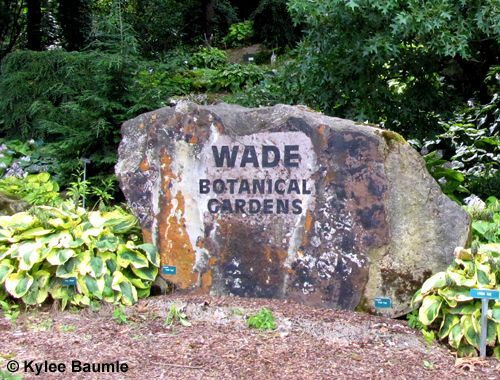 After they left, Van Wade himself took Mom and me on a tour of the grounds via golf cart, imparting all kinds of information about the history of the property and the gardens. 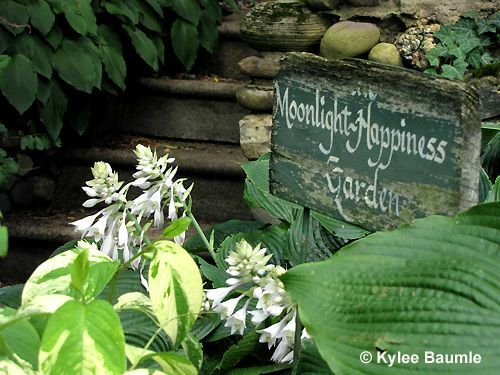 The gardens began in the 1930s when Van Wade's grandmother, Nell, along with two close neighbors, Pearl and Adelia Gatton, planted them. 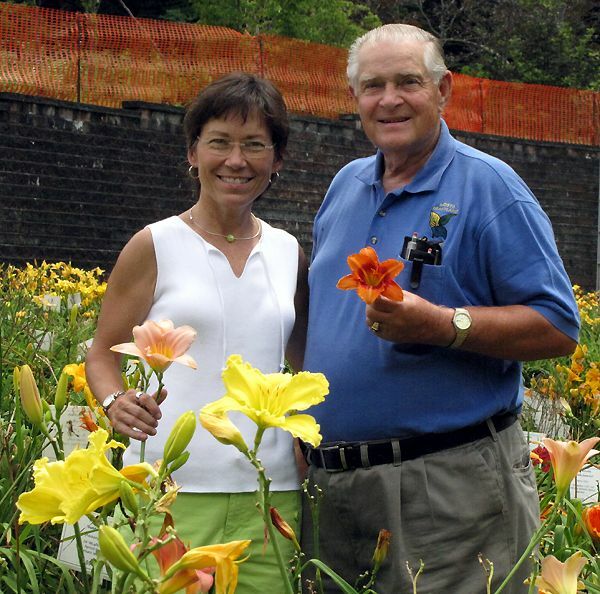 Van and his wife, Shirley, began adding to the gardens in 1983 and continue to enlarge the gardens each year. The personal tour was the highlight of our day. 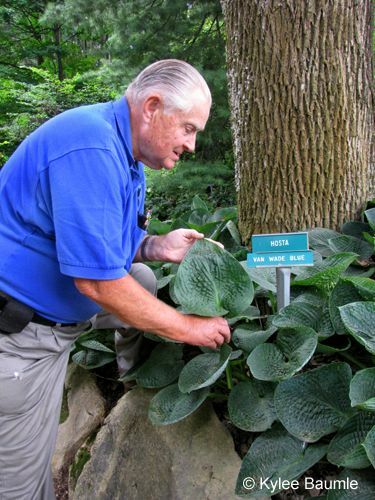 Mr. Wade, being the hosta guru that he is, simply loves his hostas and daylilies, and it's evident as he tells his fascinating stories about them. We zipped around the property in the golf cart, chatting all the while and viewing the unbelievably beautiful displays. 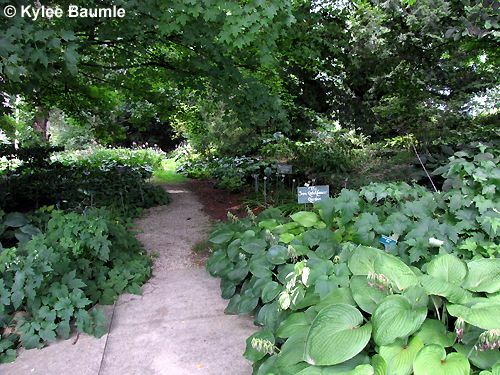 There are four hostas named for Wade, including a large blue one called 'Van Wade Blue'. 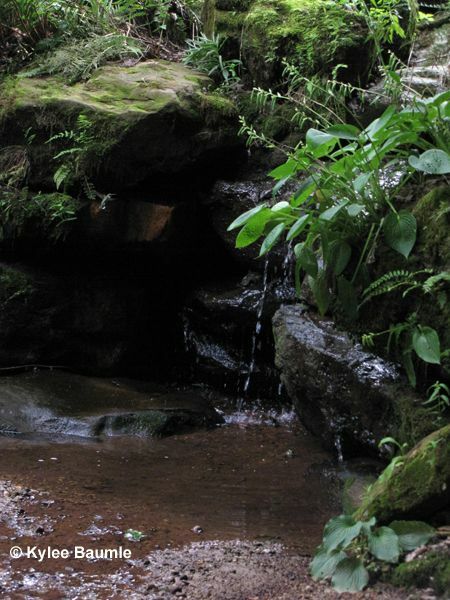 We were taken up the hill to what was the most enchanting spot on the property. Nestled in the woods was yet another large collection of hostas and a waterfall that not only captured my attention, but that of a hummingbird that kept darting in and out of the water. 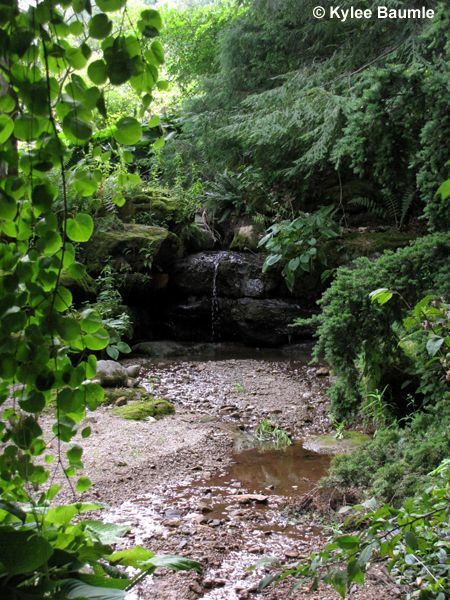 Though it was a very hot day, this Shangri-la was quite cool and peaceful, with only the sounds of the birds and the trickle of the water. 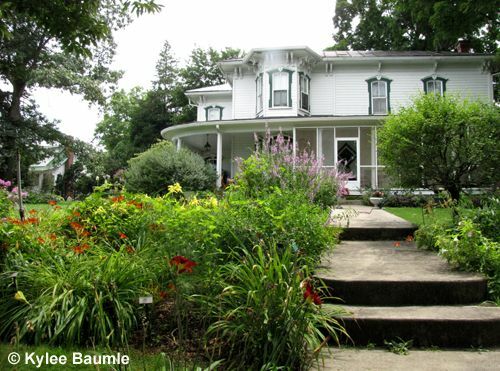 Besides the more than 3000 varieties of hostas, The Wade gardens are also home to over 1500 daylilies. 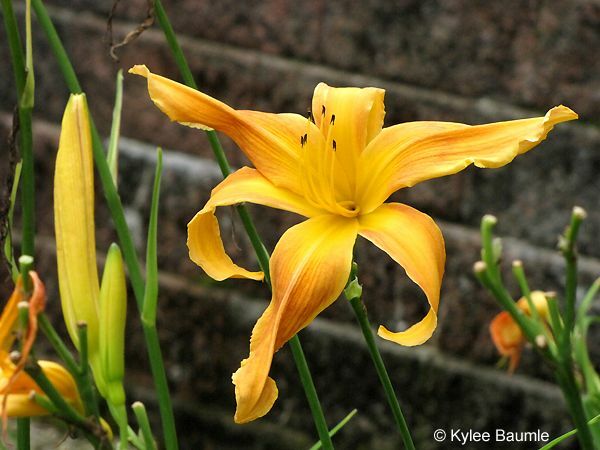 This was a good time to view the daylilies, as most were in full bloom and for this reason, was a good time to purchase. I bought a spider type - 'Selma Longlegs'. 'When I Dream', which Mr. Wade gave to me because I admired it so much. 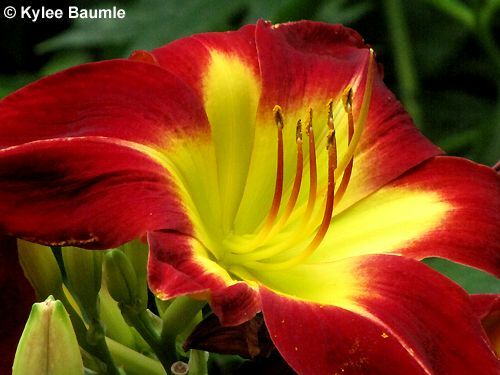 Red is my favorite color and I love how the red stamens pop right out of the brilliant yellow center. I'd heard the Wade Gardens called "hosta heaven" and now that I've been here, I know why. 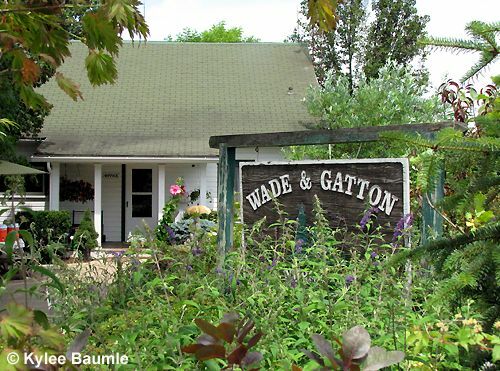 Anyone who loves this diverse group of plants really should put Wade & Gatton's on their must-see list. 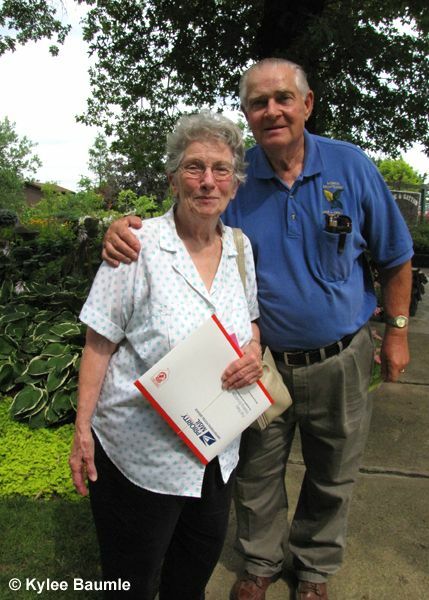 And if you're as fortunate as we were, you'll also get to meet and talk with Van and Shirley Wade, too. 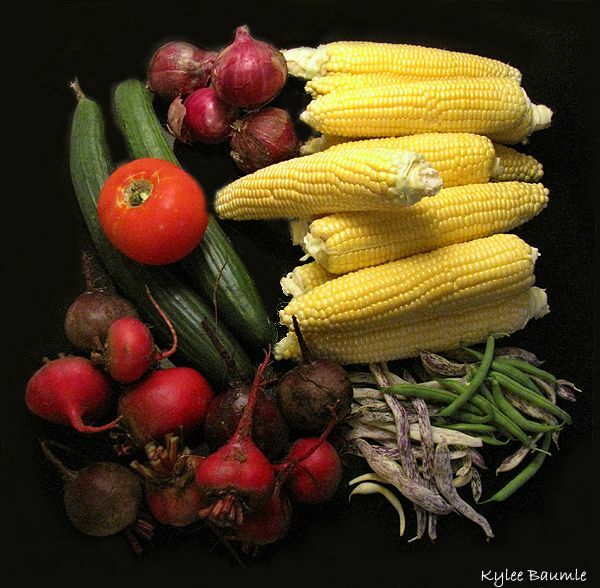 With the exception of the sweet corn, these are the vegetables we're harvesting from the garden now: Beets ('Detroit' and "Choggia'), English slicing cucumbers, heirloom tomato (supposed to be 'Black Krim' but it doesn't look like my other 'Black Krim' at all), sweet red onions, green beans ('Contender'), yellow wax beans, and 'Dragon's Tongue' heirloom beans. 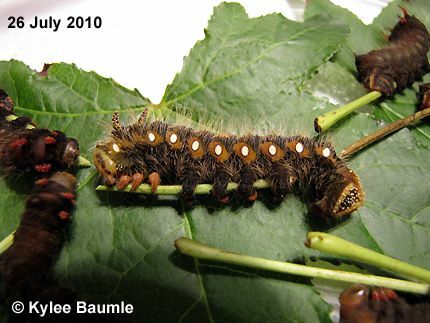 Most of the Imperial Moth caterpillars are now two weeks old. Judging by the differences in their size, it's clear that they didn't all emerge from the eggs at the same time. In fact, some were still emerging when I got home from Buffalo, meaning they took at least a week before they all hatched. 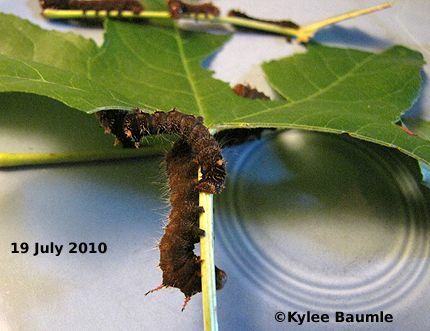 Of the estimated 125+ caterpillars, only about 10% survived. We provided them with one food source, since that would keep it easier for us. Though they have many different leaves they will eat, once they glom onto a certain type, they prefer not to change their diet. 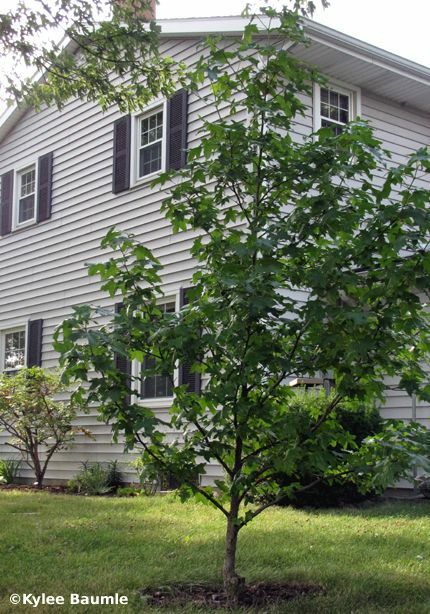 We chose Sweet Gum (Liquidambar) because we have one right outside our family room. 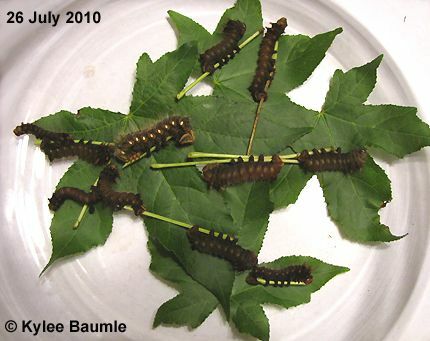 Fast food for caterpillars! They're good little 'pillars and stay on the plate while I clean the bowl! The cats are eating so much now and growing so quickly! Their frass (that's poop, for those who didn't know) started out as a fine powder. It's now about as big as the eggs were (1-2mm). I have to clean the bowl of it every day and I can see it will soon be a twice a day job. Their appetites are ravenous! I really don't know which instar they're in right now, as I've not seen them as they shed their skin, but most are certainly in their second and likely some are in their third. 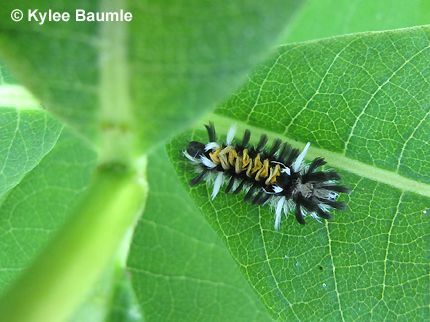 There are two forms, which become more visible by the third instar - green/yellow and black/orange. These appear to be dark brown so far, so I'm guessing these will be the black/orange, which is the less common of the two forms. They appear to be the black/orange form of caterpillar. One night, it was very quiet in the house, and I was standing by the bowl. 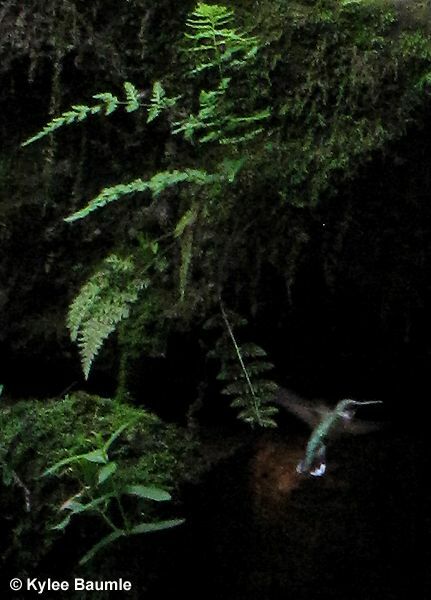 I kept hearing this faint sound and put my ear down by the bowl where the caterpillars were. I could hear them chewing! I watched them for a little while and it was interesting to see how they ate. It reminded me of how people eat corn on the cob. Some of the cats ate in a straight row parallel to the edge of the leaf. 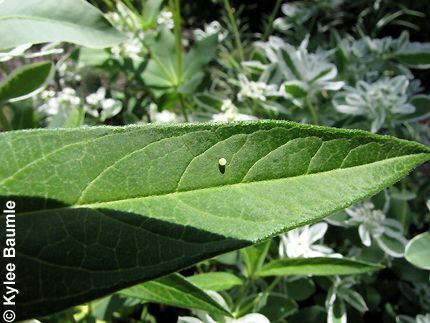 Some ate toward the center of the leaf, then came back to the edge and ate another row of leaf material right next to the previous one. 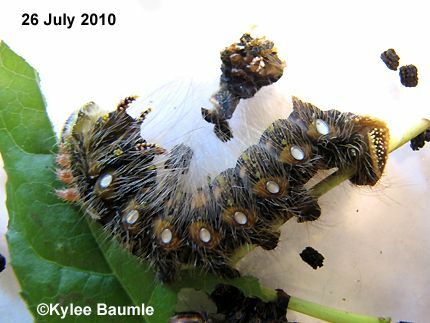 I'd kind of like to keep these inside until they get to the fifth and final instar, just to be able to see them as fully grown caterpillars. They will be about as large as my middle finger! Once they've reached full-size, I'll release them outside, where they'll wander about until they reach soft soil, where they'll burrow down for the winter.